There was a true feast of boxing action on offer Saturday night, both live and on TV, Billy Joe Saunders defending his WBO Crown in London, Saul Alvarez and Gennady Golovkin battling it out from supremacy of the Middleweight ranks is Las Vegas, yet still the Merseyside boxing fans turned out in force to support one of their own, Dayle Gallagher, as he fought for his first Championship, at the Jubilee Sports Bank in Liverpool. Unusually instead of being the final contest of the evening, Liverpool's unbeaten Dayle Gallagher clash with the Czech Republic's Daniel Bazo for the Professional Boxing Council (PBC) International Silver Welterweight title, was the opening pro bout. Gallagher is fast becoming one of the top prospects in the welterweight division, on Saturday night he proved just why he is becoming one of the most talked about young fighter from the City, as throughout the battle with Bazo he showed a maturity that belied his young age, keeping a cool head and sticking to his game plan against the seriously tough and awkward Czech fighter. Round one see both lads taking a mature and professional approach to the proceedings, tentatively testing the other out, don't get me wrong when I say testing I don't mean tippy-tappy stuff, but them both taking their time and picking their shots. Round two was a totally different affair, which see both lads aggressively attacking, yet in a controlled manner, it was a all action and a great round for the fans of pugilistic arts. More of the same in the third, and to a degree the fourth, however Gallagher's shots were carrying more power than in the earlier rounds, Bazo definitely is no walk over and the Czech lad countered in impressive manner throughout. As we entered the second half of the contest Bazo stepped up the pace, yet Gallagher kept his head and stuck to his game plan rigidly and patiently kept his cool, picking his shots for maximum effect. In the sixth Bazo again tried to force Gallagher to up the pace, but the savvy Scouse lad kept his cool and countered the hard charging Czech impressively. More of the same in the seventh BUT the eighth was fought at a scintillating pace – changing the feel of the bout from a battle to an all out war- phenomenal round!!!! After eight very, very close fought rounds referee Christopher Kelly scorecard rightly read 79-77 in favour of Liverpool's own Dayle Gallagher - after which PBC's head honcho Russell Jaques presented the beautiful PBC belt. 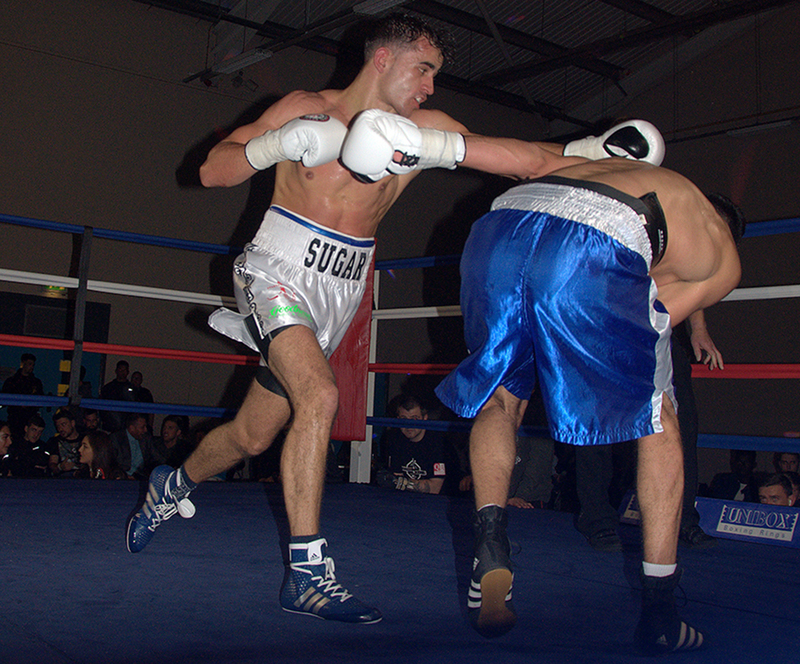 Second pro bout see local lad Johnny McConville against Stockport’s Will Cairns in a four round Middleweight contest. Wow, what can I say these two warriors went to war right from the off, I couldn't have kept count of the big shots thrown by both protagonists in the first if I wanted to, there were just so many, and even more impressively the amount that landed, from both protagonists. Initially it was hard to split the pair on who had thrown more or the most powerful but a winner for that particular round became apparent in the final minute as McConville landed a pin point perfect body-shot to send Cairns down. The Stockport lad is clearly made of sterner stuff, as not only made the count but went on the attack for the final seconds of the round. As in the first, Round two was all action with both lads dishing out vicious power shots to body and head throughout - what a round, you just couldn't take your eyes of the action for a single second. The third and final pro bout of the night see another local young lad, Martin Freeman making his pro debut against the tough and durable Marty Kayes from Belfast. Before I get to the fight itself I just have to say that in my view Freemen a new star shone brightly for the first time last night and I feel that this youngster is destined to go right to the top in the sport, this kid is class, serious class. Ok, the fight itself was pure joy to watch, Kayes is one savvy operator and as tough as they come. Believe me the Irishman really put Freemen to the test and the more importantly the youngster passed with flying colours. Freeman controlled the proceedings with ease, his ring-craft was superb and his shots were incredibly accurate, have to say if that was anyone other than someone like the super tough and durable Mr Kayes sharing the ring on Saturday night the result could quite easily have been a stoppage win on his debut, but in the last 13 years only one man has managed to stop the Irishman, and that was former Team GB star Iain Weaver! After four sublime rounds of action referee Chris Kelly rightly scored the contest 40-36 to Martin Freeman. Congratulations to not just all the boxers, but also to Fight Club promoter Kyle Gallagher, each of his shows I’ve been to has been superb, not just the location or production of the events, but also for his care to ensure that each fight is equally matched, not over matched to give the home fighter an advantage as seems to be the norm these day, can’t wait for his next offering.